I recently added smart lighting to my home. Specifically, I installed smart light switches: the switches allow my wife (who is not smart home advocate) to control the lights as she normally does (by touch), while giving me the option to use Alexa to control the lights. Unfortunately, I didn't find a great solution for lamps. There are smart lamp modules that exist, but they are physically cumbersome to use. The module is typically "installed" at the outlet. No one wants to reach down (or behind the couch) to control a lamp. Smart bulbs aren't much better; they can easily be controlled by voice, but turning off the power at the light source renders the bulb inoperable. So, I decided to build my own, using a MediaTek Linkit Duo as the board. 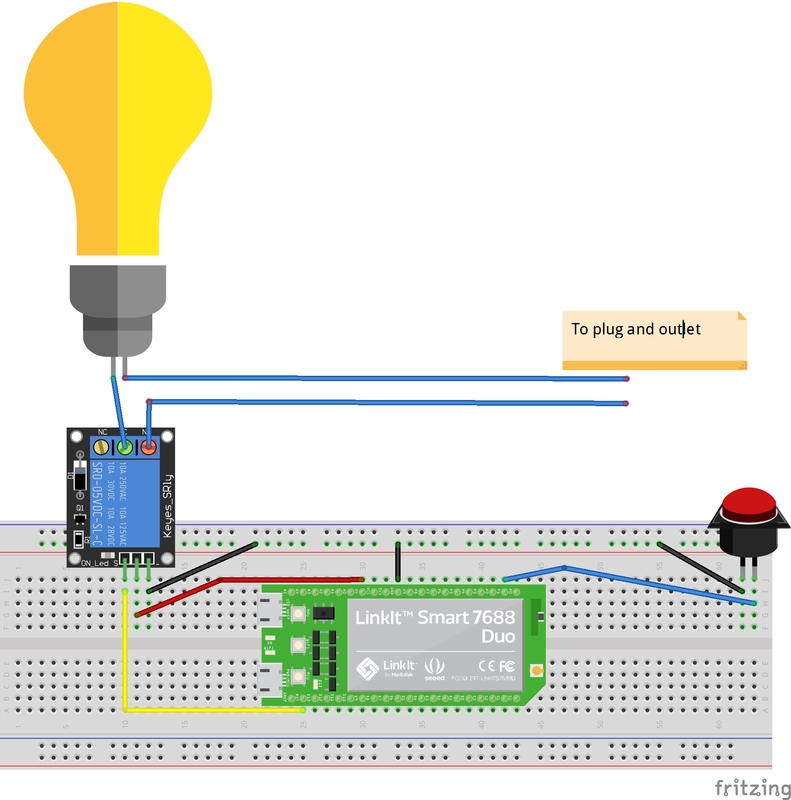 The light bulb is connected to a simple 5V relay - with connections to the Ground, 5V, and GPIO3 pins. There are two ways change the GPIO3 pin state: 1) touch (a switch/button) and 2) Alexa. An Python script that would take a command from the Alexa Skill and change the state of the relay pin. Amazon has a specific API created for Smart Home skills (these skills do not require the user to say the skill name when using the skill). There is a great five- part tutorial on their blog with very clear instructions; I created my first draft of the skill within 30 minutes of starting. Once my base skill was completed, I updated the code for use with my lamp prototype. "extraDetail1": "This is a light that is reachable"
The Smart Home Skill must also provide the ability to control the device. I used AWS IoT to send MQTT messages to the device. I needed to create an AWS IoT "thing" to receive/route the messages. The following guide explains how to create a device. A key part of this is creating the certificates, which you'll need to download and install on your Linkit. I created a script similar to the Button code; this script waited for an MQTT message and set the relay pin start to High or Low based on the message. Before I could use skill, I had to enable it and perform device discovery. Once that was complete, I was able to control my prototype via button and voice. Once I confirmed that the code worked, I went about build a more robust solution. I decided to go with a pole style floor lamp. This would allow be to snake the switch wires from the stop of the lamp to the base. There were two challenges with this approach. 1) I had to drill two small holes in the back of the lamp to install the button. I used heat wrap to cover the wires. 2) My small push button that I planned to used was defective, so I changed to a toggle switch. This was actually a more aesthetically pleasing solution, but required that I change my "button" code. Step 2 - Solder the device to a Protoboard. Full disclosure - I haven't soldered anything since my senior year in college and I barely passed by circuits 101 class, so my final solution was never going to be pretty.... but it works. 1 / 3 • The black and blue wires from the switch were snaked through the lamp pole and connect to the Linkit and the base. I clipped the power cord to the lamp, soldered the ends, and connected them to the relay (I chose the "always open" connection, but either would work). From there, I connected the relay to the Linkit Duo (see the red [5V], black [ground], and yellow [signal] wires in the picture above). Once connected, I placed the Linkit and relay and and placed both components inside the plastic project box. 1 / 5 • The lamp cord cut - pre sodering. The completed project: A regular looking lamp with smart capabilities!